This paper searched Horseback Archery method which was executed in Joseon Dynasty in the martial arts examination(武藝試驗), especially the military service examination(武科), and also concretely investigated the training method of Horseback Archery and its actual state in the base of the outcome which was obtained in the process of restoring the actual Horseback Archery. This paper closely examined the grades of the practical technique of Horseback riding and shooting from start running the horse, shooting an arrow to stopping the horse. and this paper also mentioned about the horse that is used in Horseback Archery. It explained how the practical use of tactic gets altered from using which horses in Horseback Archery. 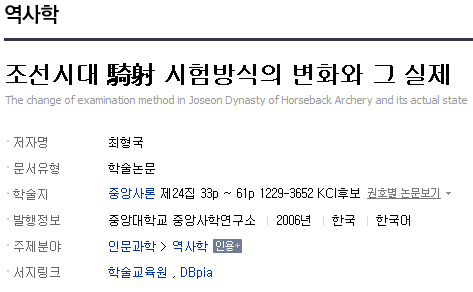 In a conclusion, Horseback Archery of Joseon Dynasty was a formula which ran horses and shot arrows in a zigzag formation riding a comparatively big horses like Homa, and can be evaluated with a effective martial arts which the individual firearms had passably developed until the latter period of Joseon Dynasty. And it also observed Donggae bow and Donggae arrow which is a equipment used in Horseback Archery. It is estimated to used for moving a bow freely on the horseback and hitting a short distance target than a long distance target more accurately. * 약간의 오해로 인해 다시 지난 2006년에 쓴 騎射 관련 논문정보를 올립니다.